Lifestyle Villas is proud to present Casa de La Familia. This beautiful Contemporary hacienda Style villa features 8,330 sq. ft of interior living space, 7 bedrooms and 7.5 bathrooms. 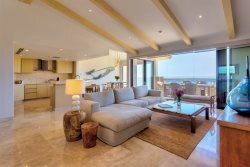 Overlooking the 18th hole & Cabo del Sol club house, the blue waters of the Sea of Cortez make a stunning backdrop for this villa. Casa de la Familia has 2 Master bedrooms, 3 guest bedrooms and Kid's room area and a separate casita area. Also features a gourmet kitchen, two pools with water slide, pool side entertainment area and palapa with an oversized firepit area to enjoy evenings. Gather around the game room with a pool table and Media room for a perfect family relaxation time. Cabo del Sol is only a 10 min drive to downtown Cabo San Lucas. From Casa de la Familia you are within walking distance to the Cabo del Sol beach and Sheraton Hacienda del Mar hotel. As a Lifestyle Villas guest, you will have access to the Sheraton Hacienda del Mar facilities: pool, spa, gym, restaurants (during peak holidays, this may not be possible due to high occupancy) and will receive discounts on green fees at Questro & Palmilla Golf courses. With the assistance of our Lifestyle team, we can plan an unforgettable vacation with all the services you would expect in a five-star resort but in the comfort of a beautiful private villa. Our Destination Specialists will work with you in the pre-planning stages, while your Personal Lifestyle Concierge will coordinate everything you need once you are in residence. Staying in a villa has never been so easy.